No doubt about it—motherhood is hard. Raising children is difficult for even the strongest of mothers. Read 6 reasons motherhood is hard for any mom, and different ways you can turn it around. Do you know any mom who isn’t overwhelmed with her role? Probably not too many, and for an obvious reason: Motherhood is hard work. So much of our lives change with having a baby. Former hobbies and schedules replaced with a demanding baby. Marriages challenged. Jobs compromised. And our happiness tested to the brink. No wonder they say parenting is one of the most difficult jobs. During my first pregnancy, I kept a green binder for articles I’d print out. The stuff I write about now, such as how to instill a love of reading or raise a thankful child. I clipped activities and crafts and read books about brain development and growth stages. But the day my son entered the world, I didn’t have time to touch that binder. And most of the articles I saved applied to him at a much later age (how exactly do you raise a thankful newborn?). I also didn’t have time—I was in full survival mode. A year later, I found that binder and laughed at myself. I did my best to prepare for this role, even imagining how I’d interact with my future baby. But only to realize that parenting is a learn-on-the-job role. 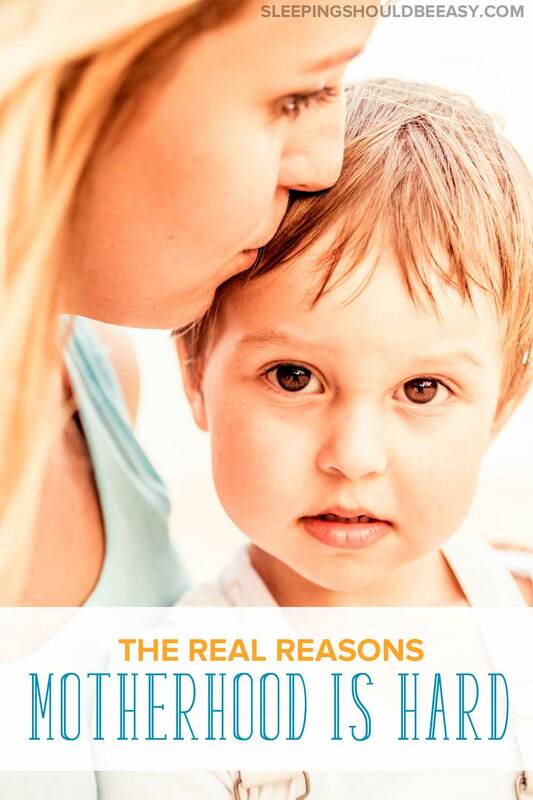 If you’ve ever felt overwhelmed with motherhood, this list of the real reasons why will resonate. …[T]here’s little even the most organized people can do to prepare themselves for having children. They can buy all the books, observe friends and relations, review their own memories of childhood… Prospective parents have no clue what their children will be like; no clue what it will mean to have their hearts permanently annexed; no clue what it will feel like to second-guess so many seemingly simple decisions, or to be multitasking even while they’re brushing their teeth, or to have a ticker tape of concerns forever whipping through their heads. Becoming a parent is one of the most sudden and dramatic changes in adult life. You don’t gradually transition into motherhood. An intern might dip his toe into a prospective job before deciding to work in that career. Partners court and flirt before committing to a relationship. Even a daycare worker or a nanny still won’t understand what it’s like to be a mom until she becomes one. Granted, we can do much to prepare.We can shadow and care for a newborn for several hours. We can research and pore through books. But that still doesn’t prepare us for who we’re meeting. Because until that baby is in your arms, you have no idea who this person is or what her needs are. You’re meeting for the first time, and it’s overwhelming. 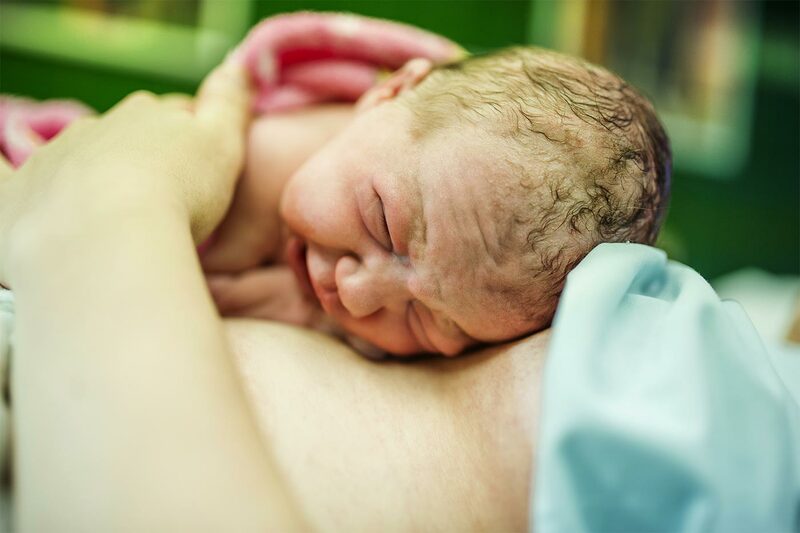 Until that baby is in your arms, you have no idea who this person is or what her needs are. How to balance this: Be kind to yourself. Understand that this is the season you’re in and that the transition is often a difficult one. While life is different now, you’ll eventually adjust to your new normal. History buffs can tell you that pre-World War II, children weren’t the focus of their parents. People had kids because it was just what they did as part of their moral and community upbringing. They also had them by the handful. One reason was because parents saw kids as economic contributors to the family. Kids work to keep the family afloat. This is not to say that parents didn’t love their children then as we do now. But their dreams for their kids aren’t the same as ours. They raised their kids to continue the same family career. A farmer raises his kids to tend to the farm, just as an aristocrat raises his sons and daughters to follow suit. What tools do we need to make our kids the best in whatever they’re supposed to be doing? What if we miss a window of opportunity and they’ll now fall slack compared to their peers? How many classes do we need to sign our kids up for so they know their potential? We’re also having fewer kids. I have three, but compared to my peers, I have a whole troupe, when the norm around me is about one or two kids per family. With less kids, we have more time to devote to each one. These precious one or two kids now become the purpose of our lives. Pretty different to the six or eight that generations in the past would raise. We sacrifice ourselves for the sake of our kids. We feel obligated to entertain them every minute lest not doing so marks us as inferior parents. And we shuffle them to enrichment activities and strain our schedules. But we ourselves can’t seem to carve out a measly 30 minutes to work out or pursue a hobby. Parents should focus and sacrifice for their children. We’ve been doing that for centuries. But we take it to a new level, making our lives more difficult compared to those with no kids. 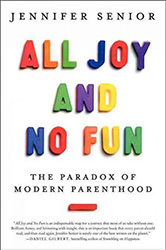 How to balance this: Balance parenthood with other parts of your life. You’re a mom, but focus on your other interests as well. Learn what to do when you’re not enjoying motherhood like you thought you would. When was the last time you had at least a full hour (or preferably more) of uninterrupted time? If you’ve been spending time with your kids, my guess is… it’s been a while. Psychologists attribute much of our happiness to the feeling of “flow.” It’s that frame of mind where you are so focused and challenged by a task that time seems to pass. You emerge from that moment feeling refreshed, accomplished, and happy. But one of the factors necessary for flow is time—uninterrupted time. So if you’ve got kids, you know kids tend to interrupt. Even if your kids can play independently, maybe you can read a few pages of a book or unload the dishwasher. You don’t get focus-intensive hours to pursue activities that bring you joy. This can come as a shock to new moms who, throughout all their adulthood, have led their days with autonomy. At work, you’re provided the opportunity to dedicate time to create, solve, or engage. At home, you’re able to choose activities that foster that focus. With kids, not so much. You spend your time doing a little bit here and a little bit there. You might be able to squeeze in chores while playing peek-a-boo with your kids. Or work on a project knowing you’ll be interrupted any minute. Parenthood becomes a juggling act. A multi-tasking balancing act between being with your kids and doing what you need (or want) to do. How to balance this: Find time for yourself, especially in long stretches. Ask another adult to spend time with the kids so you can focus. Motherhood is hard because of the challenges it brings into your relationships. You may have fought with your spouse before your kids, but if I had to guess, you fight a lot more now that you’re parents. You argue about kids and child care more so than money, in-laws, and household tasks. Moms act like gatekeepers and dads don’t do enough around the house. Couples fight more as parents than they did when they had no kids. We may differ in parenting practices. We’re ingrained in gender roles that may or may not work for either partner. Not to mention that the subject we fight about—kids—aren’t the most predictable. Having kids can be one of the most challenging tests to enter a couple’s life. But couples who “survive” parenthood are likely to remain strong through the years. Couples with kids are not happier than those without (some even say they’re less happy). But parents who are able to weather the storm enjoy a strong relationship once their kids have left the home. They tend to be happier than childless couples in their older age. Marriages aren’t the only relationships parenthood challenges once we become moms. We might lose ties with our friends, as well. Where we once enjoyed a busy social life, we now feel isolated. That can be physically (from caring for kids) or emotionally (you have less in common now). Having a social life as a mom can be difficult. Even having friends with kids of their own doesn’t guarantee the same social life as before. You might get lazy about scheduling that play date, or making the trip across town to visit one another. My husband and I both have friends with children that we still don’t get together with often. How to balance this: Prioritize your relationships. Make time for your partner on a regular basis, from nightly chats to date nights. And learn to have a social life, even as a mom. 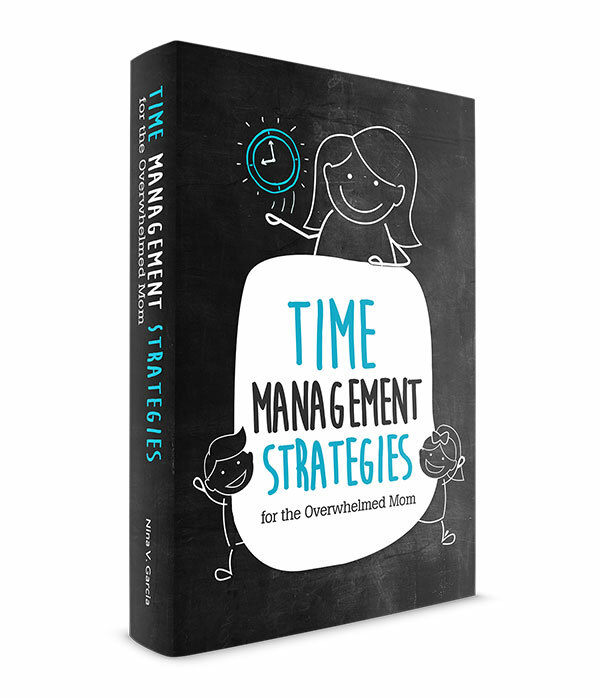 Read more on how to make time for your partner, even with kids. Me and sleep deprivation don’t go together. I learned that all too well those first few months after becoming a mom. You can’t prepare for the sleep deprivation of parenthood. You suffer from chronic fatigue while still taking care of a baby. With lack of sleep, we’re hard-pressed to find the slivers of joy in everyday life. We bicker with our partners. We make poor choices. We’re not exactly sharp. When my kids slept through the night and could put themselves to sleep was my turning point. I was able to catch that solid eight hours of sleep for myself and not rock my baby to sleep. I enjoyed life like I used to, instead of trying to survive. How to balance this: The early months of the newborn stage will be tiring, no doubt. Find ways to cope with sleep deprivation. And in time, you and your kids will sleep more restfully. If only the people we parent were able to function on the same organized and linear levels as we do. But that isn’t the case. 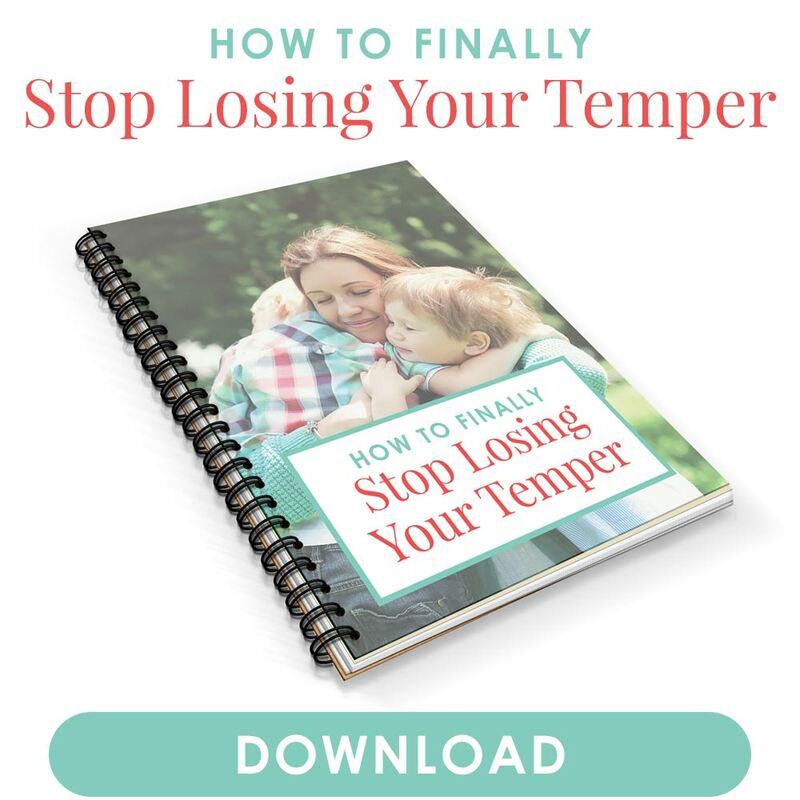 Kids test boundaries, throw tantrums, and don’t follow directions. And sometimes kids bring out the worst in us. We yell and lose our tempers. We envy others who don’t deal with kids every day and wonder if we’re even cut out for this parenting business. How to balance this: It’s normal for kids to test their boundaries. Learn the importance of being there for your child even—and especially—when she tests your patience. You can’t measure the amount of joy we feel with our kids. You find them in the little things throughout the day: The cute quirks your kids have, like the way your son mispronounces “hippopotamus” and your youngest organizes his toy cars by color. The feeling of accomplishment from having taken all the kids out all on your own. The pride in seeing your kids wash the dishes on his own and become more independent and self-sufficient. I’ve learned so much from being a mom, especially when it’s not always so easy to be one. And that green binder? It still sits on my shelf, reminding me how eager I was to become a new mom. Because the truth is, we’re good moms, even when motherhood is hard. When are the times motherhood is hard for you? What are the joyful moments that make motherhood so worth it? Let me know in the comments. And you’re the expert on funny kids, Betsy 🙂 Those moments are absolutely worth it. I love it especially when they’re not even trying to be funny. I hope your Mother’s Day is going well. So cute how they can never keep secrets. At least it’s not like when my four-year-old blurted out, “We made you something for Mother’s Day at school today.” Haha. Haha! Right. Or when my daughter said, “Daddy planted lilies in the back yard for you, but it’s a surprise.” Whoops! Loved this post, Nina. Happy Mother’s Day! Mike and I literally never fought until we had kids – and, suddenly, the very different ways in which we were brought up mattered, where they hadn’t before. Sometimes it has been hard, but our relationship is both stronger and richer as a result. And neither of us would trade our kids for anything – speaking as a tired mom who was up with a non-sleeping toddler all night last night! Oh, no MaryAnne! I hope your little girl has a better night tonight. That sleep deprivation can wreck an otherwise normal day. You and Mike were the same as me—my hubs and I never fought before kids. Like, I couldn’t even remember the last time we’d fight. Now we fight more than when we had kids. Good thing though that we generally know *how* to fight too, so that it doesn’t get out of hand. I wouldn’t know what to do if my husband and my relationship were to go awry! You nailed it — almost every single thing I think is hard about parenthood is captured in this post. And yet I would still do it all over again. Nothing has taught me so much about myself and forced me to grow up in whole new ways. It’s an amazing relationship, and I don’t want to wish time away, but I hope I have as good of a relationship with my kids as adults as I do with my own parents. It will be so fun to hand out with them when I don’t have to wipe their noses, rear ends, etc! That’s so funny Sarah because I often think about my relationship with my adult children too. I’m very close to my mom, and I imagine myself in her position with my kids when they’re older. I truly do hope that we have a happy and healthy relationship then as well. And yes, I would do it again. I realized that I was stronger than I thought and that the challenges are temporary especially after having gone through with my eldest. With my twins this time around, I’m more mellow and not trying to “rush” things so much, knowing that it’ll go by so fast and to cherish the moments instead. There is so much truth in every single line of this post. The challenges are so very real, but the joys are so much bigger. Nailed it! Gosh, motherhood is by FAR the hardest thing I have ever done. I still have flashbacks to the sleep deprivation and the survival mode of those early days. It’s tough, but it is the best thing I have ever done. Happy Mothers’ Day to you! I am gonna keep it short and sweet and just say that I found so much truth in every single sentence you wrote. My days seem filed with constant, rivaling little moments of pure joy and (hopefully disguised) frustration. I am starting to realize that that IS motherhood. I pray every day to let the moments of joy outweigh the rest. Happy Mother’s Day to you, Nina! I hope you had a wonderful Mother’s Day too, Vanessa! I think there’s a sense of peace in realizing that motherhood isn’t always peachy keen. Sometimes (especially with younger kids) you even more difficult days than happy ones. I think this acceptance helps moms keep expectations in place, to not be so hard on themselves, and to appreciate the joys of motherhood in whatever means it decides to enter our lives. The hardest thing about motherhood for me is that I’m constantly changing my approach as my son grows. It’s like having to learn new plays in a football game over and over. I thought that it would be smooth sailing after he started school but now he’s getting bigger and making memories. He has friends and plays sports, there’s so much to keep in line. At least now I know it won’t be getting any easier any time soon, but despite all that, motherhood will always be amazingly beautiful. Isn’t it nuts how new challenges just seem to take over the old ones? Haha. Still, I do think that kids get generally easier as they age. I think at about the 3yo mark was when life started to get smooth again. I mean, really smooth, where my eldest was much more independent than he ever was (obviously). However now that I have the twins, I’m in no rush to have them grow up. I think this is something that second-time moms realize. You spend all this time with the first worrying about milestones and wishing the challenges away, then realize that it all goes too fast. Such great and true reasons why being a parent is so difficult! I had almost no sleep for a year, and I just didn’t function well. And I totally agree with your “flow” comment… so many of clients struggle because they are perpetually interrupted, which makes task completion very difficult. Parenthood is like being launched into a “you are not in control” movie! It’s so true Seana. There’s a marked difference between functioning sleep deprived and functioning with adequate sleep. It was rough without sleep for sure! And yes, whenever I try to do anything at home with the constant interruptions, it’s not as fulfilling as simply doing it with 100% focus.